These Hickory Bunk Beds feature full log side rails allowing for sturdy construction while individually hand-crafted to accentuate the natural beauty of the logs. All Hickory logs are bark on and kiln dried to a specific moisture content and are clear coated with lacquer finish for extra durability. 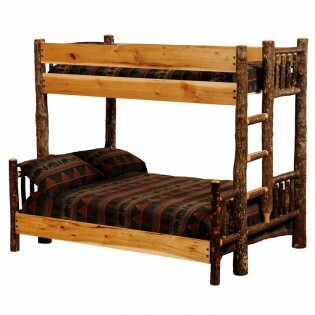 These bunk beds come in 5 sizes, and a choice of right or left ladder. Please allow 4-6 weeks for shipping.